Wales prop Gethin Jenkins has vowed not to retire from international rugby as he aims to reclaim his starting place. The 35-year-old is Wales' record cap holder with 121 but has been on the bench for Wales' first two Six Nations games, with Rob Evans preferred. Cardiff Blues loose-head Jenkins admits the 2019 World Cup will be "too far" for him but is determined to regain his place in the Welsh front row. "I'm still as hungry as ever to put that Welsh jersey on," he said. "Even though I'm on the bench, I still think I've got something to offer. "It all depends on your regional form. I'd like to think if I'm still playing well week in, week out then I would have a chance of being involved. "I can't see me retiring because I'm still eligible to play for Wales." 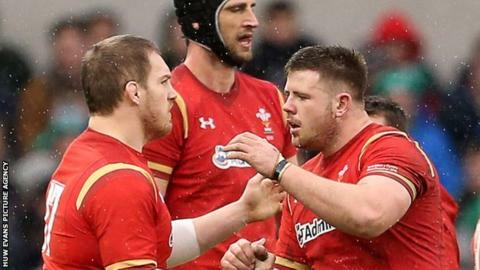 Wales head coach Warren Gatland sprang a major surprise when he selected Evans, 23, ahead of Jenkins for their Six Nations opener in Ireland. Scarlet Evans kept his place for last Saturday's win against Scotland, with Jenkins appearing from the bench in both matches. As a veteran of three British and Irish Lions tours, Jenkins is not used to being on the Welsh bench but has been impressed by Evans. "It's different for me but Rob's gone really well and I've enjoyed supporting him and trying to make an impact off the bench," Jenkins added. "I think he's been outstanding in the first two games. He's still young at international level but learning every week. "He's a strong scrummager and carries very well around the field. He's only going to get better. "That's good for Wales that they've got someone coming through now who will hopefully be there for the next 10 years. "It's quite hard watching, different nerves as to starting, when you know what to expect." After selecting Evans for the Ireland match, Gatland said Jenkins would not play at the 2019 World Cup. "That's probably going to be too far for me, the World Cup," said Jenkins. "That hasn't really entered my thinking. "When the time comes, I'll do that [retire] but at the moment I'm just concentrating on playing week in, week out for the region and playing well."